We all need batteries - not only for the trimmers on this website but for many household uses. This USB smart battery charger is more than just a great battery charger for standard size batteries AA and AAA NiMH and NiCD. The multi functional design and extra adapters makes this charger your external portable power source. Providing power for mobile phones, tablets notepads and almost any other device using a 5 volt input. 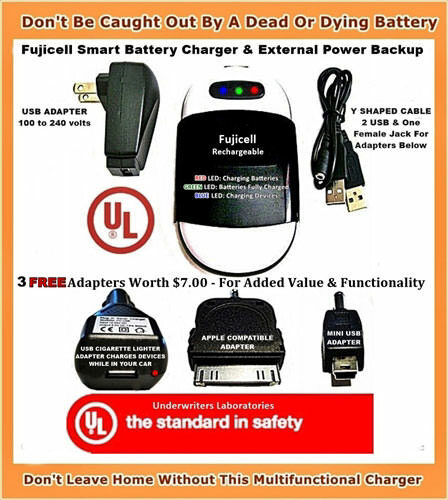 * Need a AA or AAA battery charger which is more than just a charger? * Need power during blackouts, brownouts, storms or power cuts? * Not near A/C mains power outlet on the road driving or camping? * Smart phone, notebook, reader or tablet battery keeps dying? How can you beat this price? Giving you LESS for your money? We all use more and more battery operated appliances and electronic devices. The need for batteries is rising. So it makes huge financial sense to buy rechargeable batteries which help to limit the avalanche of spent batteries sent to the landfill. 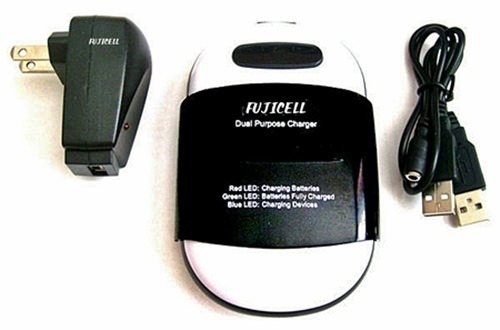 Because our personal trimmers need fully charged quality batteries to work correctly we recommend the Fujicell USB & mains Battery Charger. 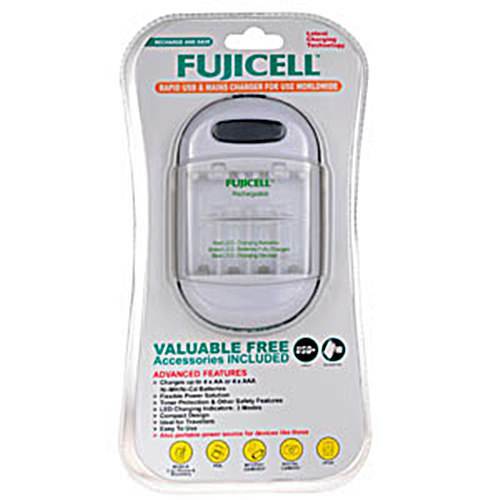 This can also be used for recharging any brand of standard sized AA or AAA batteries, either NiMH or NiCD. This electronic charger is wonderful travelling companion and can be used worldwide on the local electricity supply of 100 volts to 240 volts. 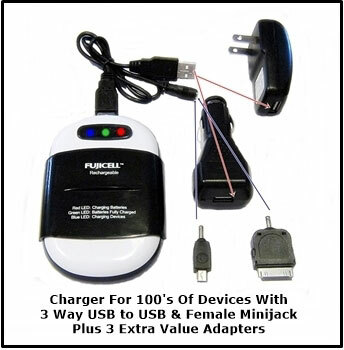 This full function charger auto checks battery condition, switches off once batteries are charged and pulses batteries to restore and preserve battery lifespan. It is not one of those cheap battery chargers you see in stores or on TV. Cheap chargers cannot switch off and remain always on even when the batteries are fully charged. Apart from wasting electricity this overcharging generates heat which is the enemy of battery life and results in your batteries not being able to recharge much sooner than normal. As the resistors are different, when connecting this charger you MUST use the USB charger cables supplied - NOT the cables that came with with your mobile device. * When the batteries are fully charged, the charger will automatically switch to a minimum maintenance charge if batteries are not immediately removed from the unit. * Charge time stated is for a full charge starting with fully discharged batteries. Delivery was super fast. Package arrived undamaged and in good order. Love this charger & it saves me a bunch. I can charge batteries and power my USB devices on my daily commute to work using the car cigarette lighter adapter. Cannot beat the price. Glad I got the adapter as this makes the battery charger into an external power bank for my I-Phone.